The roles and the molecular mechanisms of the tumor-induced platelet aggregation. Aggrus, a membrane sialoglycoprotein expressed on the tumor cells, plays a central role in the platelet aggregation. 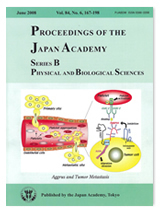 The illustration in the cover of this issue is the schematic representation of the function and the regulation of Aggrus during the formation of hematogenous metastasis. The pathogenesis of hematogenous metastasis is dynamic and consists of many steps including detachment from the primary site, transport along the circulation, arrest in or adhesion to the capillary, and proliferation in the distant organ. Because most circulating tumor cells are rapidly destroyed in the bloodstream, less than 0.01% of these cells form metastasis foci. Tumor cell-induced platelet aggregation promotes survival of circulating tumor cells and the formation of hematogenous metastasis by increasing the arrest of tumor cell emboli in the microcirculation or by protecting tumor cells from immunological assault in the circulation. However, the molecules associated with the tumor-induced platelet aggregation had not been identified. Dr. Tsuruo, Dr. Fujita, and their colleagues identified Aggrus, a membrane sialoglycoprotein with a molecular weight of about 40,000, as a platelet-aggregating factor expressed on a number of human cancers. 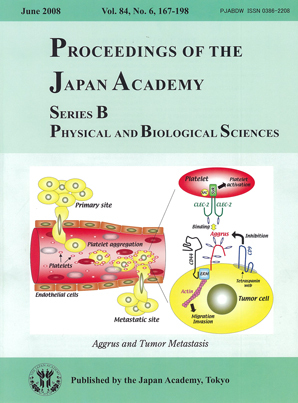 Because hematogenous metastasis is reduced when neutralizing antibodies or eliminating carbohydrates attenuates platelet-aggregating activity of Aggrus, the main contribution of Aggrus to hematogenous metastasis is by promoting platelet aggregation. Aggrus could serve as an ideal target for drug development to block hematogenous metastasis. Further, Aggrus may have other functional implications in vascular pathogenesis.